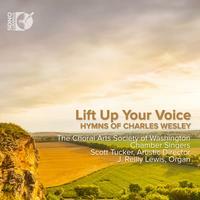 This new release is a full album of hymn favorites written by Charles Wesley. Wesley is one of the greatest hymnwriters in history, penning over 6,000! Included are titels such as 'Hark! the Herald Angels Sing,"" ""Jesus, Lover of My Soul,"" and ""O For a Thousand Tongues to Sing."" The Choral Arts Society of Washington, founded in 1965, has experienced monumental success, performing with the national Symphony Orchestra, the London Symphony, the Mariinsky Orchestra, and many more. The Chamber Singers is a small ensemble of thrity, launched on the Society's fiftieth anniversary. Scott Tucker, artistic director for the chorus, has prepared choruses for Christoph Eschenbach, Vassilly Sinalsky, Marin Alsop, among others. J. Reilly Lewis, a graduate of Oberlin Conservatory and The Julliard School, is a world renowned organist and is the Music Director of the Cathedral Choral Society.